Beijing artist Wu Xiaowu studied photography and Chinese traditional painting at the Modern Art Institute of Tianjin Art Academy. 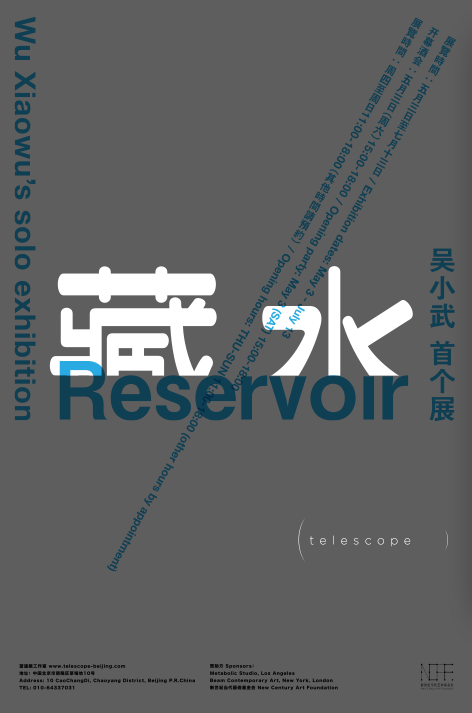 Telescope is pleased to present his first solo exhibition, entitled Reservoir. 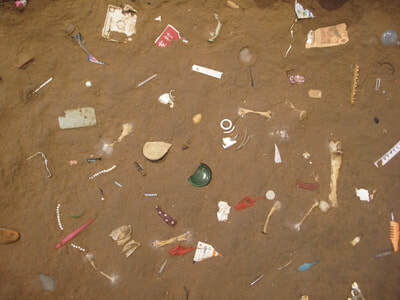 As a child Xiaowu was fascinated by the stones in the river of his hometown in the southern China’s Hunan Province. The tops of the stones along the sides of the river were dry and of one coloration but underneath, submerged in the cool water, they were more luminous and seductive. After he gathered them from the riverbed they soon started to change and by the time he got home the water had disappeared and the stones had lost their beautiful luster. Either the water had retreated into the stone or had evaporated into the air but he did not know. 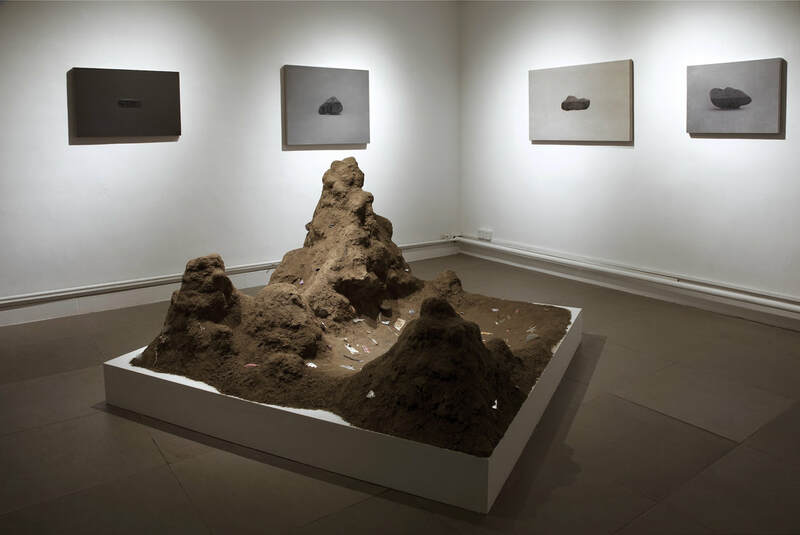 In recent years, now living in Beijing, Wu tried photographing found stones to recapture this childhood fascination but the photographic process treated the subject the same as the drying air did to the wet stones. 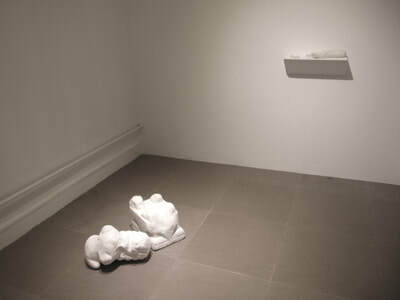 They lost the luster of mystery in the transformation from a wet stone to a photograph. In the photographic process an image on an exposed sheet of photographic paper is latent or unseen until the paper is submerged into a water chemical solution. Then the image appears. But in this case he was not satisfied. It was not enough to reclaim the mystery and beauty of the actual water on stone. 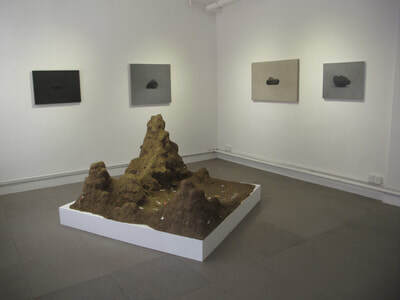 The paintings in his Telescope exhibition are the newest incarnation of his quiet investigation of water hiding in stone. Wu’s oil paintings are more closely aligned to ancient Chinese literati and atmospheric perspective paintings than they are to western painting, but they also are connected to the photograph, a western invention. Simplifying his subject and background in minimal hues of grey Wu paints detailed portraits of common stones he has gathered from the city’s roads and highways. These roads, for many people who have migrated to the large cities of China for work, have replaced the rivers of their childhood. These stones are of no importance, they seem to have lost their way as time has eroded their features and drained them of color. But, Wu suspends them in time by dipping them halfway into water and painting them with their watermarks in place forever. Using the rich medium of oil paint he imbues these stones with a mysterious life beyond our experience and understanding quite like the life scholar rocks have had for Chinese culture for 2000 years, or meteorites have for todays scientists and the Public . Scholar rocks were appreciated for their aesthetic beauty, and used as a focal point in contemplating spiritual or philosophical principles, and for meditation prior to writing poems or painting. Wu’s common stones have a similar ancient but also futuristic alluring ambience. 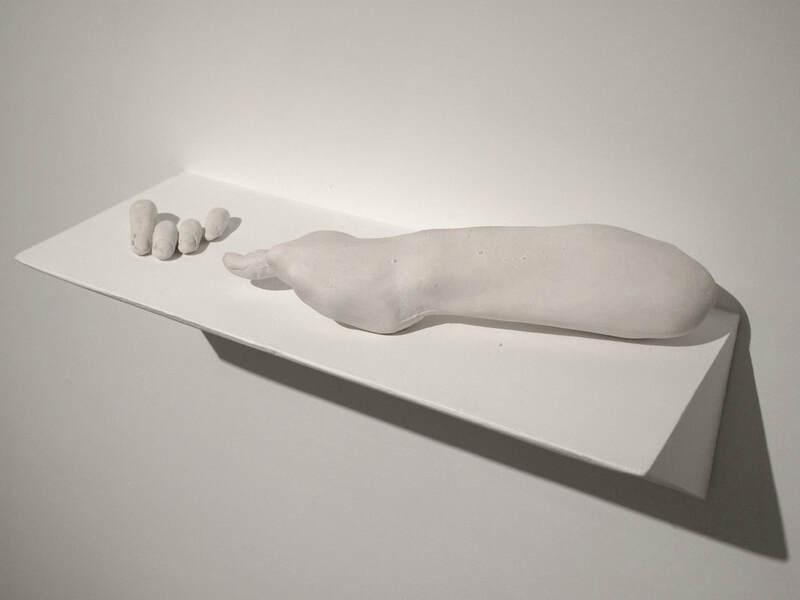 Also included in Wu’s exhibition are his plaster sculptures of arms, hands, and fingers separated from their bodies. Their surfaces are worn smooth, all remnants of turmoil from their dismemberment or pains of life have been removed and their identities washed away. They are like ancient alabaster bones that rest glowing white in a place far away from all pain and worry. A marble Chinese Foo Lion lies on the floor, the place where it traditionally stood proudly keeping guard over the house and its inhabitants. But now it lies broken and forgotten, its face worn away by the river of time. Its features barely revealed seem to be the ghost of a creature within pressing out against the soft stone for release. It is a haunting portrait of an anonymous personal and cultural identity. In the main gallery the dominant work is a large sculptural installation made of dirt and the detritus and refuse of the city. It resembles a model of the towering misty mountains of Guangxi found in traditional Chinese landscape painting, or even of Mars, or an alien world of the future that has imbedded in its landscape the fossilized garbage of a distant world’s extinct civilization. Wu has built mountains with urban 21st century soil that hold a reservoir of stories and lives seen only by what people have left behind.